As a LoveLula Accredited Blogger, I have an opportunity every month to select some products from their site so that I can then test them and review them on my blog. As a big fan of soap bars, quite a few months back I decided to have a look at all the natural soap bars they have on offer and selected those that I thought were the best, for testing purposes. I decided not to pick the soaps which have certain ingredients in them such as added colouring. I wanted to focus only on the most natural soap bars, with minimal ingredients and also on those which already had pretty good reviews online. I decided to skip some of the soaps which I thought had too many ingredients. That was just me being fussy but you are still welcome to check them out on LoveLula (as these are not included here). Summary: Certified organic natural soap suitable for the most sensitive skin, vegan. 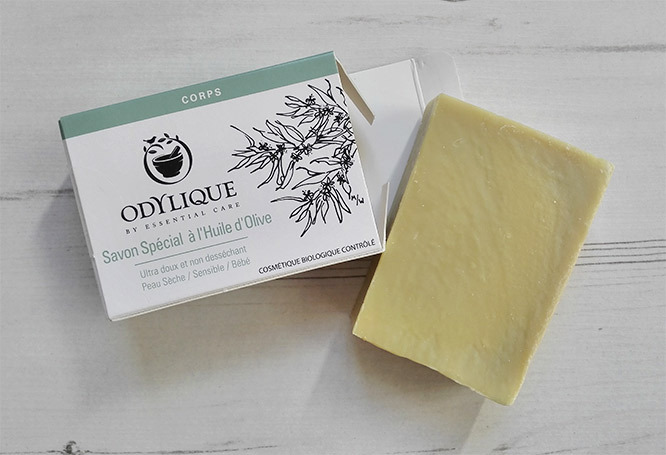 If you want something really simple, with no essential oils, with the simplest ingredients, then you should try Pure Olive Soap Bar from Odylique. This soap bar is suitable for the most sensitive skin, including skin that is prone to eczema and dermatitis. It contains only four ingredients: Sodium olivate, aqua, sodium cocoabutterate, sodium ricinoleate. Or in plain English: Saponiﬁed virgin olive and castor oils, Saponiﬁed cocoa butter. Odylique Pure Olive Soap Bar soap is 100% natural and certified organic by The Soil Association. It’s vegan and does not contain any common allergens such as tree nut oils, dairy, soy and wheat. This natural soap is really solid but when in contact with water it starts to soften, giving you a nice, rich and moisturising lather. It’s not drying at all, quite the opposite actually. It’s quite moisturising and your skin will feel nice and soft after use. For this reason, it’s great for dry skin I believe. The scent is the scent of an old-fashioned bar of soap, not exactly nice, but it’s because it doesn’t have any essential oils so that it can be suitable for the most sensitive skin. But that doesn’t bother me as other things are more important when it comes to natural soaps, like a nice lather and non-drying effect. Odylique’s solid soap must be one of the simplest soaps I’ve ever tried. I must say though that it didn’t last for a very long time, two good weeks if I am correct. But this was a regular use between two people and I used it as a shaving soap too. In terms of price, it’s a little bit on an expensive side – £6.50 for 100g and I believe that’s because it’s handmade and certified organic but this still puts it on top of the list because it’s of a good quality, simple, effective and suitable for the most sensitive skin and even for babies. Summary: Mild soap, suitable for the most sensitive skin, can be used on babies. Lasts longer than some other natural soaps. Calendula is a bright orange healing plant that has many benefits for the skin, for example, it helps to heal wounds and improves skin firmness and hydration. 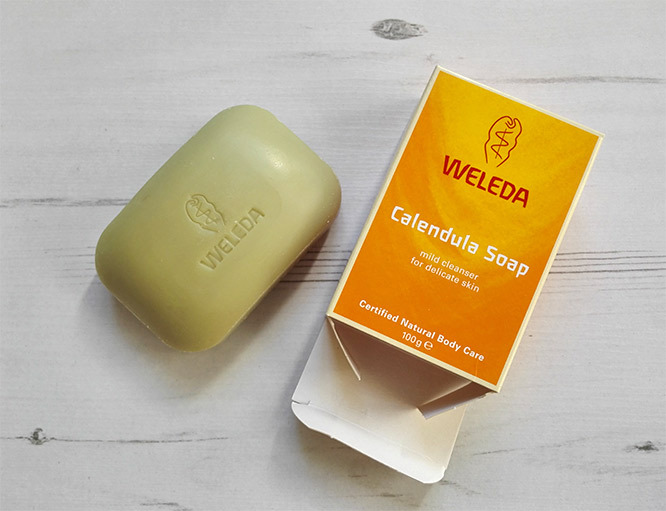 Calendula Soap Bar from Weleda is a surprisingly greenish colour, not orange as expected. Apart from the calendula extract, you will also find a chamomile extract in it, another ingredient great for the skin as it has antiseptic and anti-inflammatory abilities (great for soothing irritated and inflamed skin in the case of acne, eczema and rashes). This soap from Weleda is really mild and suitable for the most sensitive skin – it can even be used on babies. In addition to healing plant extracts, it also contains moisturising oils such as olive and coconut so after use your skin will never feel dry. It foams really well and it feels like you don’t have to use much of it for a good clean. For this reason, it lasted longer than Odylique’s soap. I think it was about 3 weeks (or slightly more) before I replaced it with another soap. Calendula Soap Bar costs £5.50 for 100g which is a reasonable price for a natural soap like this. Summary: Handmade vegan soap great for sensitive skin, smells delicious. 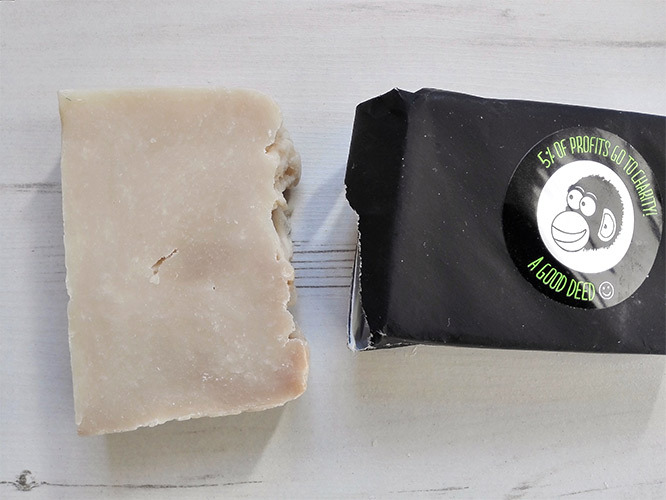 The natural soap bar from PureChimp is vegan and great for sensitive skin. It smells delicious and when using it for the first time I couldn’t determine what the smell was down to. But after checking the packaging, I could see that they put natural banana flavour in it although the final scent is not so much banana-like but it’s still gorgeous. This is a really lovely soap and I feel that after the shower my skin feels extremely soft and so lovely. I cannot remember getting an exactly the same feeling from some other natural soaps. What makes this soap a little bit more special is that it’s handmade and it’s also hand wrapped in gorgeous black paper. But this is not all that important. The main thing is that this soap is totally non-drying and will make your skin feel gorgeous after use. No tightness! The main moisturising ingredients in the soap are Olive Oil, Coconut Oil, Shea Butter and Cocoa Butter. PureChimp Super Soap costs £4.95 for 100g which is well worth it for the goodness it brings. It lasted me for a good 3 weeks with my fiance using it occasionally so it’s a really great soap. This soap previously came in one of the LoveLula beauty boxes but I decided to revisit it just to remind myself what’s like using it and just to give it a proper review. This is a small soap (42g) which makes it great for travelling. It’s certified organic by Oregon Tilth (a USA certification body). There is also a bigger version of this soap (128g – £7) which I estimate should last for at least 5 weeks if not longer (based on the usage of the small soap). Of course, it depends on how many people use it. I give this estimate based on my own personal use (just one person normally). Lavender, Rose Geranium & Ylang Ylang Soap (packaging is slightly different now) foams really well and leaves the skin feeling soft and squeaky clean. It may not leave the skin feeling as soft as some other natural soaps but still, it helps as I’ve been complimented on how soft my skin was after using this soap. This natural soap is made with organic palm and coconut oils with an addition of olive oil for that extra nourishment. The essential oils of lavender, geranium and ylang ylang produce a lovely floral scent, but not overpowering. The scent is actually quite faint when you use it in the shower. The small soap lasts a surprisingly long time for its size (about 3 weeks when showering every day) and this makes it a good value for its money. I use the usual natural soap bars for shaving so I was really interested to see how this multipurpose Birch & Cedarwood Cleansing & Shaving Bar was going to work especially for this purpose. My first thoughts were that if it was designed for shaving it should be better than the typical natural soap. So how did I get on with it? Actually, I was really impressed with the lather it produces, it’s perfect for shaving. The lather is rich and thick, especially if you are using the soap with a sponge. The soap does not irritate the skin. The cedarwood scent stands out more than any other scent but it’s not overpowering and in the shower you can barely smell it. This is the first time I tried cedarwood scented soap and I came to the conclusion that I prefer other scents or no scent at all. This multi-purpose soap is great for both men and women. For now, I am using it mostly for shaving purposes but it can be used for general cleansing as well. I think it will last me for a long time since it’s quite big (128g). If you are looking for a natural shaving bar, I would definitely recommend it. It’s currently not available on LoveLula but hopefully, they re-stock very soon. 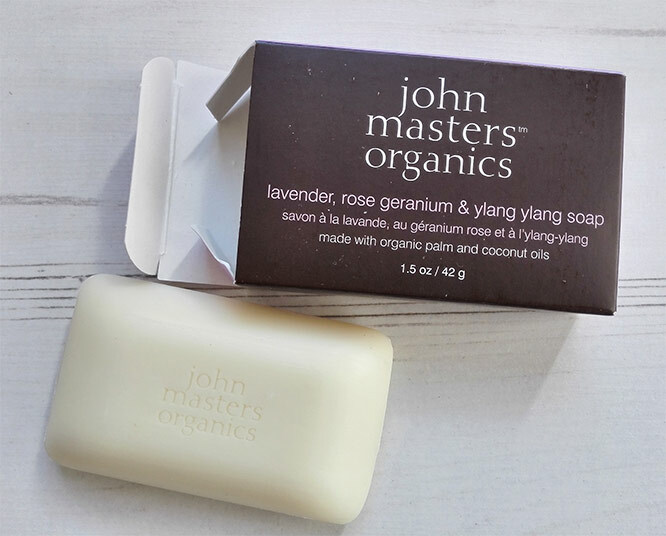 Meanwhile, take a look at John Masters Lavender & Ylang Ylang soap bar. 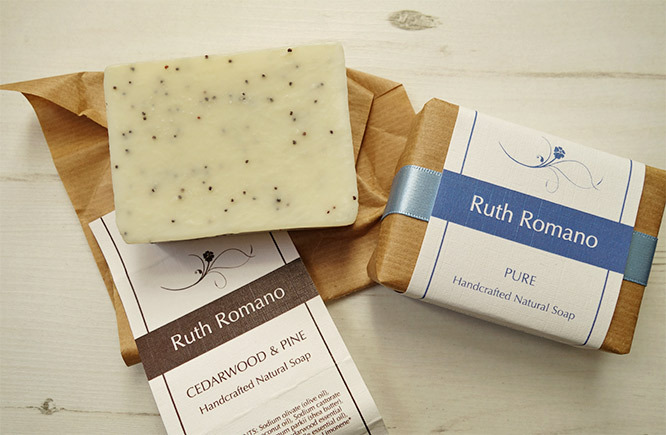 There are two natural soaps from Ruth Romano that I managed to test so far: “Pure” and “Cedarwood & Pine”. Ruth Romano soaps are handmade and created with vitamin enriched oils which nourish and care for your skin. Ruth Romano uses the simplest ingredients and believes that less is more. There is no palm oil in these soaps. All of the Ruth Romano soaps are suitable for vegans. Summary: Long lasting handmade natural soaps of great quality, vegan, palm oil free, suitable for sensitive skin. The “Pure” soap is fragrance-free which makes it suitable for sensitive skin and those with allergies. It has actually won a Free From Skincare Award this year so definitely worth considering. The Pure soap bar is made with the simplest ingredients such as olive oil, shea butter, castor oil and glycerine. All these ingredients work together to nourish your skin and help to keep it moisturised. The lather is rich and creamy and after using this soap your skin will never feel dry. This soap lasted me for about 4 weeks (with regular use) which is amazing as not many natural soaps of this size last that long. In this case, it makes it worthwhile spending a little bit more to get better quality and a longer lasting soap (£5.95 for 100g on LoveLula). 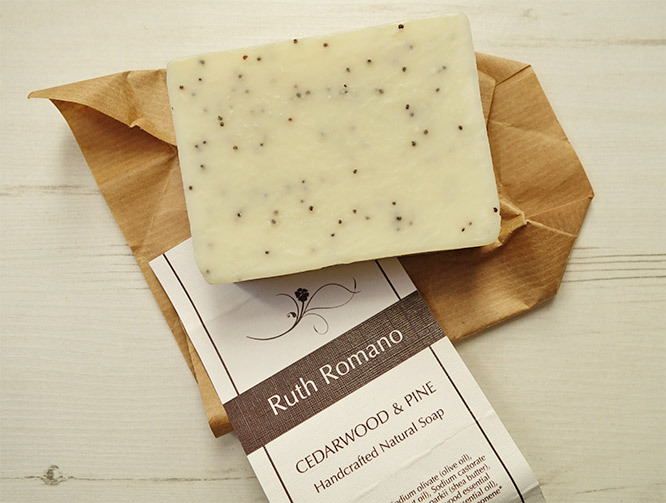 The other Ruth Romano soap that I picked, Cedarwood & Pine Soap Bar, has similar ingredients to the “Pure” soap bar but the difference is that it’s scented with cedarwood essential oil and pine needle essential oil. It also has an addition of poppy seeds which are there to act as an exfoliator. The soap has won an award in 2016 – Best Buy Award in The Green Parent Natural Beauty Awards which was one reason why I wanted to try it out but also because it was different from other natural soaps due to the exfoliating particles. So how did I get on? First of all, this soap is really gentle and when you use it with a sponge you only get a few poppy seeds on it, so you won’t get a massive exfoliating action but this is great for everyday use. It’s very creamy and feels really luxurious so yes, a lovely product. The scent is not that strong and you can barely smell it when having a shower which I am totally fine with it. I expect this natural soap to last for a long time, just like the scent-free version. The price is the same – £5.95 for 100g. You can get it on LoveLula here. Ruth Romano handmade soaps have certainly impressed me and I would love to try also other scents available such as Lemongrass and Lavender. Summary: Moisturising, long-lasting soap bar that you can use for skin exfoliation. Contains sustainable palm oil. 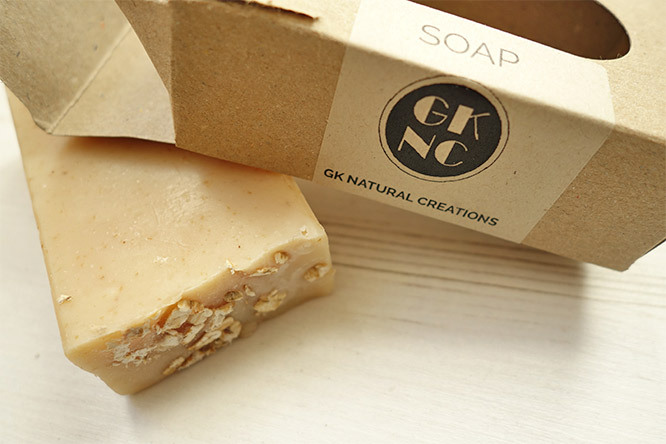 Honey and oats are two ingredients which are great for the skin – moisturising, nourishing and soothing, so I couldn’t wait to try Honey and Oatmeal soap bar from GK Natural Creations as I really wanted to see what it does for my skin. The lather of this soap feels really creamy but I am not convinced it is more moisturising than some other natural soap bars that I’ve tried. On touch with water the soap starts to lather very quickly, even more so than some other natural soaps. The scent is lovely, slightly sweet, but it doesn’t stand out much when having a shower. I’ve noticed this is a common theme with natural soap bars actually, although stronger scents do come out a little bit more (cedarwood, for example). Honey & Oatmeal soap bar from GK Natural Creations also has an addition of orange peel oil and clove which is a lovely combination but I just wish the scent would be stronger. After washing myself with Honey & Oatmeal Soap, my skin feels lovely, the softness is there and my skin doesn’t feel dry. So no complaints there. The oats in the soap are supposed to gently exfoliate the skin and this is achievable if you press the bar directly onto the skin but not so much when you use it on a sponge. All soaps from GK Natural Creations are handmade and since I got myself a few of these soaps, I’ve noticed some bars are slightly bigger than others which is what you would expect from handmade soap bars, but all of them should be a minimum of 100g in weight. Honey & Oatmeal Soap is a natural soap that will last you for a long time. I used it for 2 weeks and there was still about half of a soap bar left. Overall, Honey & Oatmeal Soap is a good soap bar, made with luxurious ingredients and the big plus is that it’s long-lasting. I just need to mention that it contains palm oil which is sustainable. It’s competitively priced at £4.95. Get it on LoveLula here. Summary: Nourishing, long-lasting soap, great for dry and sensitive skin. The other soap that I picked from GK Natural Creations was Calendula & Goats Milk soap which I was really excited to try. Goat’s milk is great for the skin as it’s rich in essential fatty acids which are great for moisturising the skin. Goat’s milk is really nourishing due to its fat content and therefore great for dry skin. This soap also contains calendula flowers which are known to be healing and soothing. It also has an addition of glycerine which is moisturising and will make your skin feel lovely and soft. The Calendula & Goats Milk soap bar (£4.95 for 100g) doesn’t have any particular scent, it just smells like a bar of soap (a natural one! ), so basically there are no essential oils in it which makes it great for sensitive skin. To see how this soap bar compares to Honey & Oatmeal soap I did an experiment – I washed half of my body with the Calendula & Goats Milk soap and the other half with Honey & Oatmeal soap. I wanted to see if my skin felt any different. And yes, it did actually. 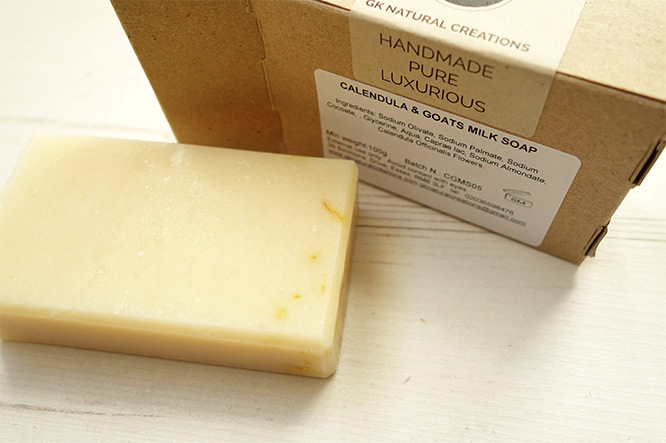 Calendula & Goats milk soap makes the skin feel slightly softer. This soap is made using sustainable palm oil and the soap base is the same as the other GK Natural Creations soap that I’ve tried so I am guessing that this soap should also last you for a while (around 4 weeks). You can get it on LoveLula here (currently out of stock, but hopefully will be back soon). Summary: Rose scented soap bar suitable for dry, problematic skin. Silky Roses Soap from GK Natural Creations has a lovely rose scent that comes from Rose Geranium Oil but it’s not very strong when having a shower. It’s enriched with shea butter and castor oil, making it great for dry skin. Shea butter is really nourishing and at the same time healing and protective. I don’t remember trying a soap bar with castor oil in it before but after looking online I can see that castor oil is great for skin problems such as acne, dry skin and inflamed skin. It is healing and rich in beneficial fatty acids. It also has natural antibacterial and anti-fungal properties. It definitely sounds like a great ingredient to have in a soap bar, especially if you have skin problems. 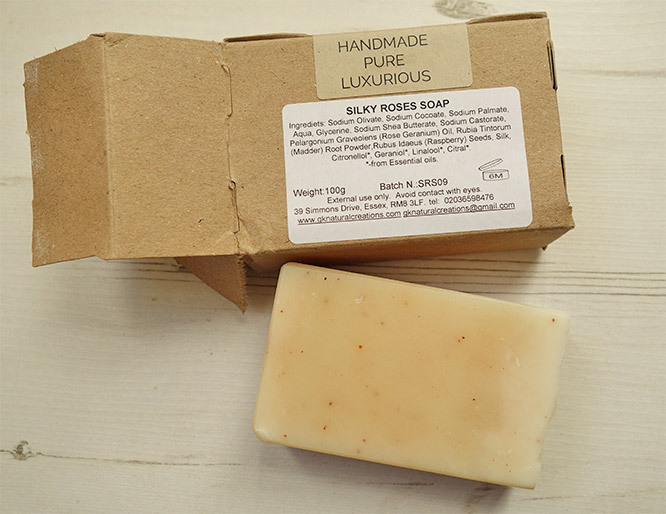 You can get Silky Roses soap from GK Natural Creations on LoveLula here (also £4.95 for 100g). If not in stock, alternatively, check GK Natural Creations Sea Salt SPA Soap. I haven’t personally tried this soap myself but I gave it to my fiance to try. Real Man’s Soap from The Handmade Soap Company is a huge soap, weighing 160 g and this means it will last you for some time. Understandably, it costs a little bit more than some other natural soaps as it’s bigger (£6.95) but it’s still a great value for money. My fiance said it had lasted him for about 6 weeks. He found it great, with a slightly ‘manly’ scent coming from Sweet Orange, Wintergreen leaf and Basil essential oils. He didn’t have any complaints about it so it must have been good! 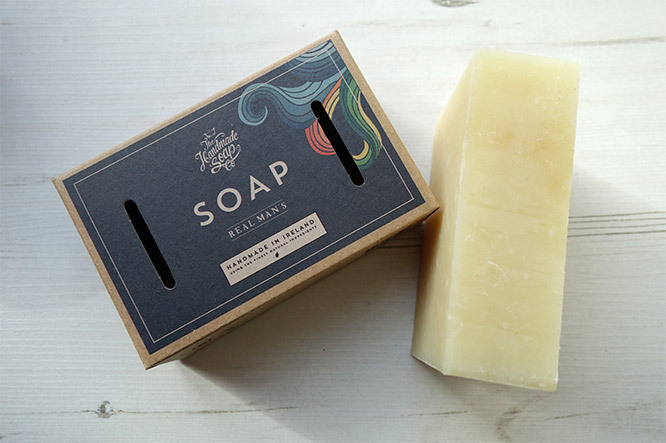 The Handmade Soap Company are based in Ireland and apart from natural soaps, they also make other products such as shampoos, shower gels and candles. Their ingredients are ethically sourced and they only use sustainable plant-based ingredients. You can buy Real Man’s Soap on LoveLula here. Summary: An affordable, handmade soap bar suitable for mother and baby, palm oil free. Vegan and halal. I picked this soap bar as it’s suitable for both a mother and her baby. You can use it on your body, hands or even your face. Anything that is multi-purpose/multi-functional strikes a chord with me. It’s just because why would you have several different types of beauty products when you can have one? I am not a mother myself (yet) but I know some mothers would appreciate me featuring this natural soap bar. Safflower & Calendula soap from PHB Ethical Beauty (£3.95 for 100g) is a really simple soap, with minimal ingredients, so no essential oils which could be irritating. The soap base is made using the simplest ingredients: coconut oil, olive oil and shea butter. It also has an addition of hydrating safflower seed oil and added calendula powder for that soothing and calming effect. 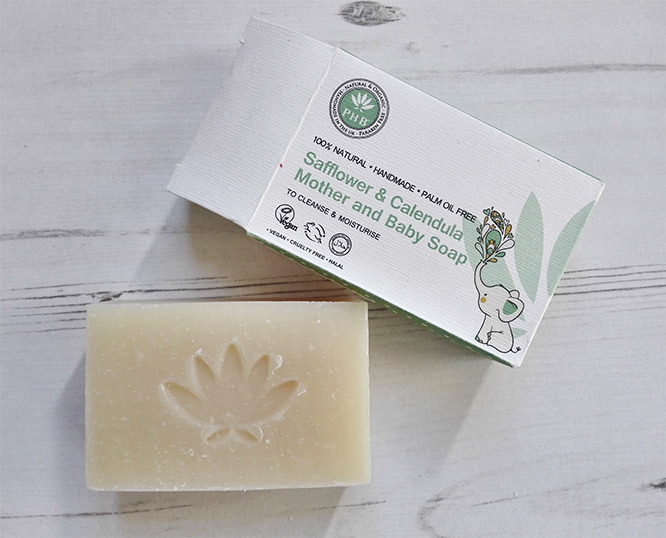 If you are looking for a mother & baby soap bar which contains no palm oil, this is it. This soap is not only palm oil-free, it’s also handmade, vegan and let’s not forget, cruelty-free! The soap produces really creamy and moisturising lather and it’s very gentle. You can get it on LoveLula here. This soap is a little bit different from others as it’s round and also smaller (75g) so this would possibly be a great travel soap. It normally costs £3.50 which is a reasonable price. I cannot find it on LoveLula at the moment but I’ve noticed you can get a selection of Trevarno soaps on LoveLula which is better value for money. 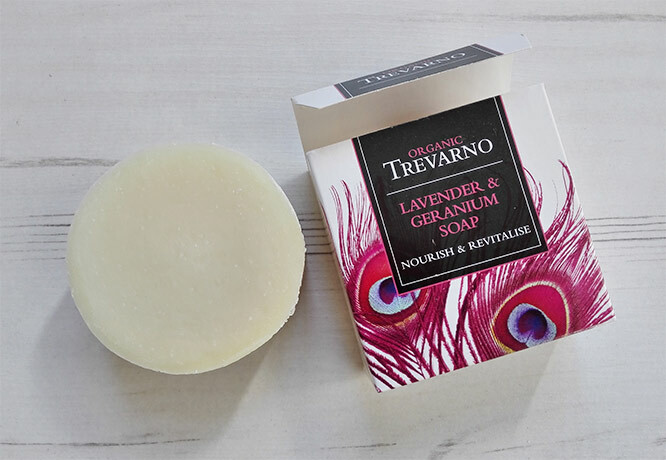 I am not sure whether Trevarno still produce Lavender & Geranium soap bar, to be honest, as I cannot find it on their website either but they do produce a Lavender soap which is not too much different. Trevarno soap bars are handmade, palm oil-free and made with the purest natural & sustainable ingredients. I love the fragrance of Lavender & Geranium soap, I can definitely smell it before using the soap. The ingredients used are organic although the soap itself is not certified organic. The soap is non-drying and well-made. After a week of use, I have plenty of it left. Summary: Super moisturising soap bar, suitable for babies and very sensitive skin. Vegan and palm oil free. 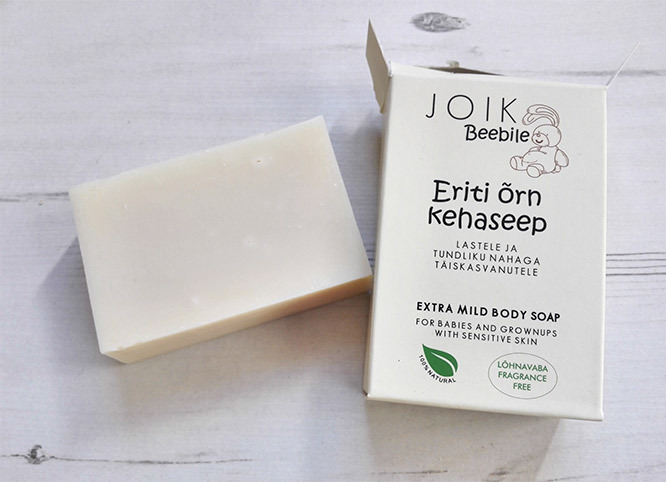 Extra Mild Body Soap from JOIK is another natural soap bar suitable for babies. But this is not only for babies, it’s for adults with sensitive skin too. This soap doesn’t contain any fragrance. JOIK natural soap is super creamy and feels lovely on the skin. After wash, my skin feels really soft and cared for, probably softer than after using some other natural soap bars. This must be because the soap is made with moisturising shea butter, cocoa butter and avocado oil. It also contains coconut oil and sweet almond oil which are all great for the skin. Joik’s soap bar is suitable for vegans and contains no palm oil. It lathers well and after using it for a week, I have plenty of it left. It’s a very solid soap bar that doesn’t melt easily when left in the shower. It costs £6 for 100g. Summary: Vegan soap bar with a lovely fruity scent. Non-drying. I decided to pick this natural soap bar from Pacifica as I read quite a few reviews of this soap with people saying that they loved it, especially the scent. This is the only soap bar that comes wrapped in some kind of plastic which is a little bit disappointing as I don’t think there is a need for it. Hopefully, they will stop doing this soon as it’s just unnecessary packaging (or maybe they’ve already stopped doing it, just I am not aware of it). 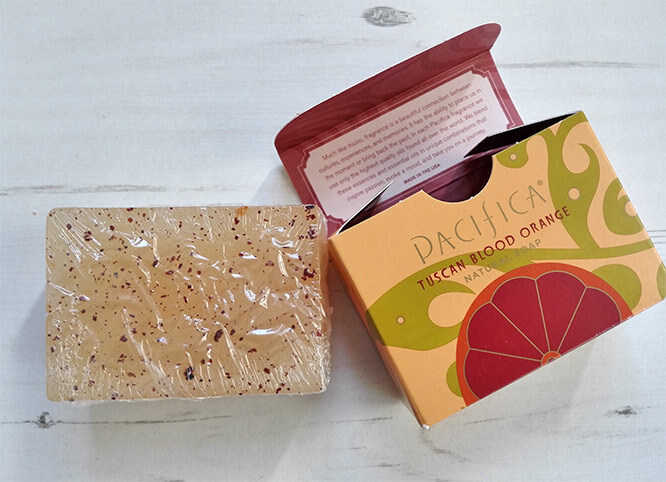 Pacifica’s Tuscan Blood Orange natural soap has indeed a lovely, fruity scent which stands out more than the scents of some other natural soaps that I tried. When I first started using it, in the beginning, the scent was definitely stronger but after more than a few uses, it faded a little bit. I can still smell it, under the shower though, although it’s not that very strong now. The soap is non-drying and leaves the skin feeling lovely and soft but I would just say that some other soaps that I tried are slightly more moisturising. It’s still however a great soap which will last you for a while since it’s quite big (170g for £6.95). Like other soap bars mentioned here, this soap is cruelty-free but it’s also vegan as it contains no animal ingredients. This is a lovely soap, great for morning showers as it will definitely wake up your senses. 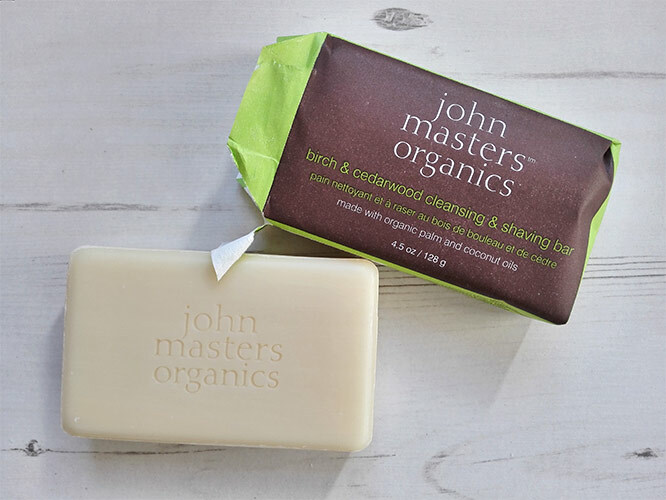 So these are some of the best natural soap bars you can find and although this is not a complete list, it’s a good starting point for when you are switching from liquid soaps to solid soap bars. Have you tried any of these soaps and which one is your favourite?